Looking for something sweet to serve as a snack, or side dish to go with pork or chicken recipes? 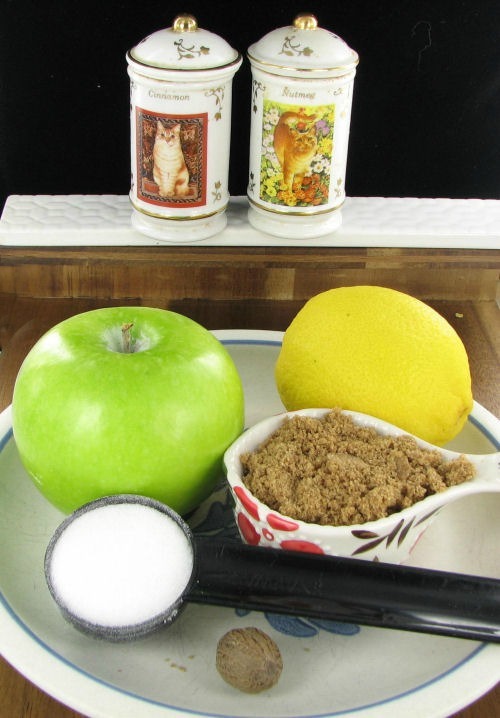 Homemade applesauce is one of the easiest recipes out there. There is no earthy reason to buy it at the store when you can have it done in about 30 minutes and the home made version is hardly recognizable from the jarred kind in the stores. If you would like the flavor of thick applesauce to go with pork or chicken, try my recipe for warm baked cinnamon apple slices. They are the bomb! One of the secrets to good applesauce is to use good cooking apples, such as Granny Smith, Fuji, Jonathan, Mcintosh, or Golden Delicious. The hold up best with the heat. Basically you just peel the apples and cook them on the stove top with the rest of the ingredients. What could be easier than that? 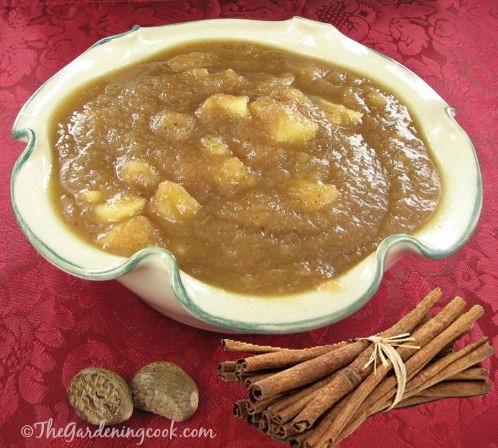 The combination of the cinnamon, nutmeg and brown and white sugars gives the applesauce a delicious sweetness. I ground my own nutmeg for extra taste too! I love the smell of nutmeg balls run over a grater. It gives a promise of good things to come! Once you have made good homemade applesauce, you will wonder why more people don’t do it instead of buying the store bought kind. This applesauce is delicious hot with pork recipes, or cold with whip cream, yoghurt or a dollop of ice cream. You can also puree it and use it as a replacement for oil in baked goods to make them more healthy. The recipe freezes easily, and will last up to a year in the freezer. 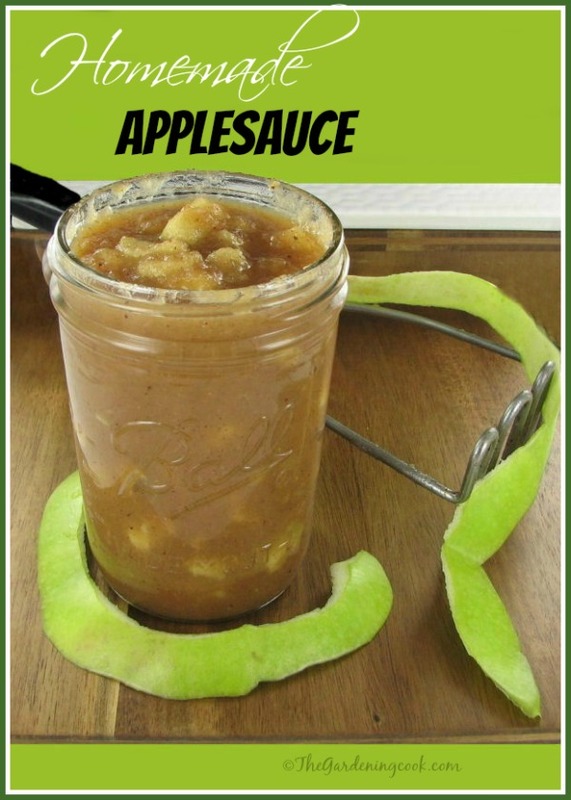 There is no reason to purchase store bought applesauce when it is so easy to make with this recipe. Peel and core the apples and cut into chunks. Place them in a saucepan with the other ingredients. Bring to boil then lower heat and simmer for 20-30 minutes stirring occasionally. Remove the pan from the heat. Mash the apple mixture with potato masher until it is the consistency that you like. (I like mine with lots of chunks in them, so I don't go crazy on the mashing part.) You can also puree the mix with a food processor, hand mixer or immersion blender, if you like a smoother applesauce. Keep refrigerated until ready to use. Delicious hot with pork recipes, or cold with whip cream, yoghurt or a dollop of ice cream. The recipe freezes easily, and lasts up to one year in a freezer.